Troshchynsky, Dmytro [Трощинський, Дмитро; Troščyns’kyj], b 1749 in Hlukhiv, Nizhyn regiment, d 1829 in Kybyntsi, Myrhorod county, Poltava gubernia. Official of the Russian imperial government and patron of Ukrainian culture. 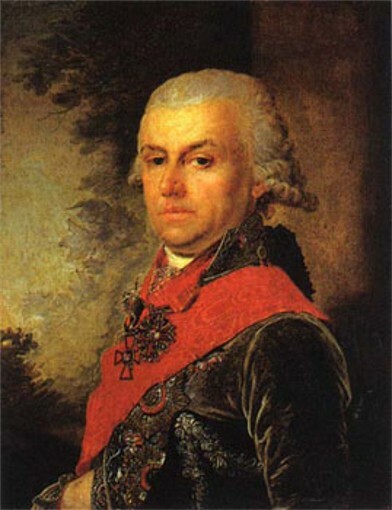 After graduating from the Kyivan Mohyla Academy he worked in the Little Russian Collegium (1766), fought in the Russo-Turkish War of 1768–74, and served on Prince Nikolai Repnin's staff. Upon moving to Saint Petersburg he rose from director of Count Oleksander Bezborodko's office (1784) to state secretary (1793) and senator. He was rewarded by Alexander I for his part in the plot against Paul I with an appointment to the State Council and the directorship of the imperial postal board. 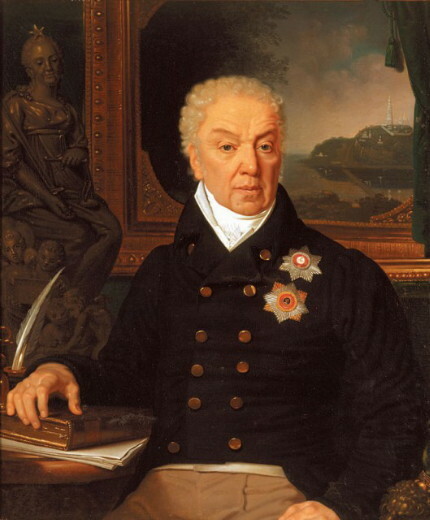 After serving as minister of appanages (1802–6) he returned to his estate and was elected marshal of the nobility in Poltava gubernia (1812–14). During Napoleon Bonaparte's invasion he helped raise troops and then was minister of justice (1814–17). After retiring to his Kybyntsi estate Troshchynsky turned it into a Ukrainian cultural and political center, called the Ukrainian Athens by his contemporaries. He shared the autonomist aspirations of his colleagues Vasyl Kapnist, Pavlo Koropchevsky, and Mykhailo P. Myklashevsky and supported or encouraged Ukrainian scholars such as Yakiv M. Markovych and Vasyl Lomykovsky, writers such as Kapnist, Vasyl Hohol-Yanovsky, and Arkadii Rodzianko, painters such as Volodymyr Borovykovsky, and composers such as Artem Vedel. He acted through his friend O. Kamenetsky to get Ivan Kotliarevsky's Eneïda (The Aeneid, 1798) published. At his estate he set up a large library of over 4,000 titles and a private serf theater run (from 1812) by Hohol-Yanovsky, assisted by Kapnist. According to recent research Troshchynsky headed a clandestine circle of Ukrainian autonomists in the late 18th and early 19th centuries and maintained contacts with opposition circles in the military through his relative Gen P. Bilukha-Kokhanovsky, the brothers Fedir and Vasyl Lukashevych, and other participants in the Smolensk conspiracy of 1798. He assigned great importance to the organization of Ukrainian military units; hence, he supported Kapnist's project for a Cossack regiment in 1788 and the Cossack mobilization in Left-Bank Ukraine in 1812 (see Ukrainian regiments in 1812).